Why you need baby detergents? With a newborn, there comes the joy into any home, but with the joy comes changes in the way you do things around the home. One of these changes is washing your baby’s clothes. Keeping a high level of cleanliness is important from their room to the clothing they wear. This is where baby detergent plays a vital part of any home and choosing the right one is a daunting task. You can buy different brands on the market from scented, non-scented to organic detergents. When using baby laundry detergents you prevent eye and skin irritation from breaking out on their skins. As the residue left behind in using traditional detergents can cause the ailments happening. With us, you can choose a mild detergent made for your baby’s clothes. Each of the products selected is made for sensitive skin and very effective for keeping their clothes clean and chemical free. For an industry leading baby detergent, get your hands on the Puracy Natural product. With the new 4-enzyme formula, it helps eliminate stains and the ingredients are mineral based. The formulas created by doctors for sensitive skin and has no sulfates or toxins present. The detergent you can buy in a powdered formula and never been tested on animals. Further, it is safe to wash baby’s diapers with the detergent and not harmful for septic systems. With one bottle, you can wash up to 96 loads of clothing and only need a ¼ ounce per load when used in an HE machine. When you buy the Puracy, a small amount goes to a Charity. 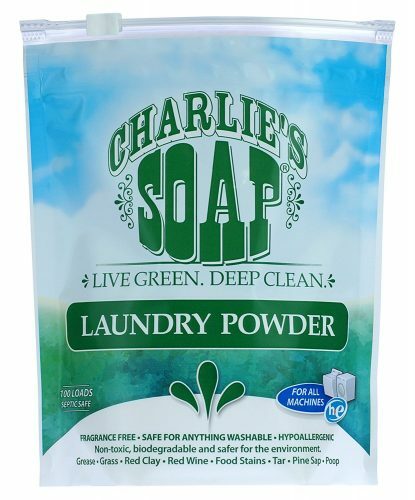 For a soap powder, that leaves no residue behind try the Charlie’s Soap Laundry Powder available in a 2.64 lbs jar. The detergent is biodegradable and as it is non-toxic and made of natural ingredients, it is safe for baby and the environment. You can use it in your washing machine or by hand. The disinfectant is fragrance-free and has no added chemicals that act as a brightener. Even the jars made from post-consumer recycled plastic. Once you open the jar, it may smell a bit fishy but the odor dissipates after opening. 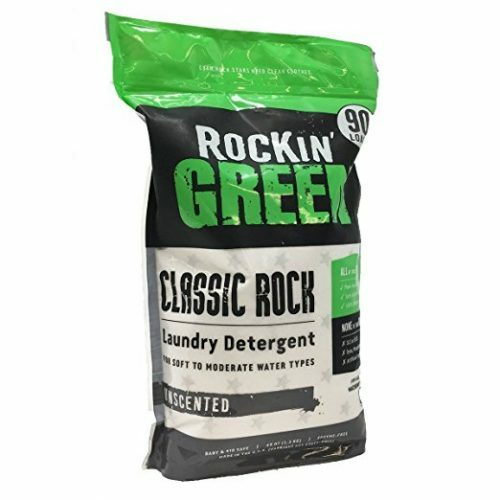 For an unscented and natural baby laundry detergent that is ideal for their sensitive skin try the Rocking Green formula. The disinfectant is perfume free and has no harsh chemicals used in the ingredients. The formulas concentrated and available in a powder form. The soap is suitable to use in High Efficient and standard washing machines. Further, it does not have any dye or fillers and you only need a few tablespoons per load. You can buy the product in a bag and is enough to wash up to 90 loads of washing. Rockin Green has a plant-based formulation and they have not tested it on animals. The other exceptional thing about the detergent it’s formulated for people living in areas with hard water. 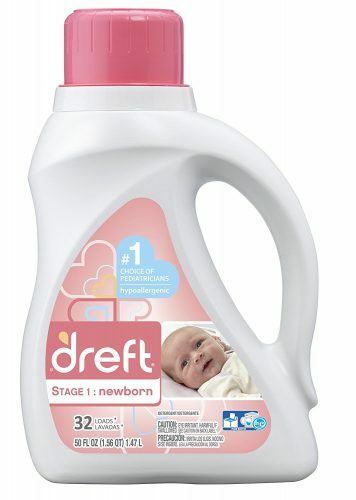 One more top rated baby detergent is the one provided by DREFT. You can buy the formula in a liquid form sold in 150 fl oz bottles. The detergents formulated specifically for babies to keep their skin allergy free. The product comes highly recommended by Pediatricians and supplied in a post-consumer recycled plastic container. The soap has a fresh scent and a bottle goes a long way up to 96 loads per bottle. The liquid is color safe, phosphate-free, and suitable for newborns clothing. Further, you can use it in a High Efficiency and Traditional Washing Machine. For further information, you can view their safety data sheet here. Babies need lots of love. 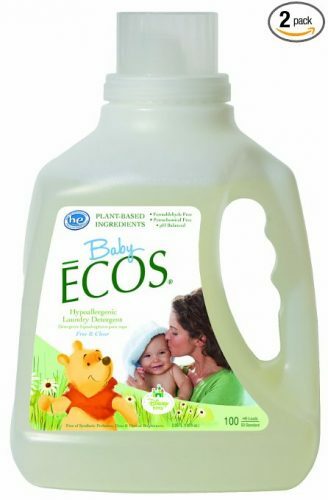 With the Ecos Disney detergent by Earth Friendly, your baby’s delicate skin is in safe hands. When washing with the Ecos your newborn’s clothes will be clean and stay soft. The detergent works as a soap and fabric softener and has a great value, as you only need to buy one product. The cleaning agents made from plant-derived ingredients. You can use it in hot or cold water and is safe for standard and HE washing machines. The product is hyper-allergenic and petrochemical free with an ultra concentrated formula that is suitable to use on the entire family’s clothing. This is a natural cleaner that is biodegradable and not tested on animals. 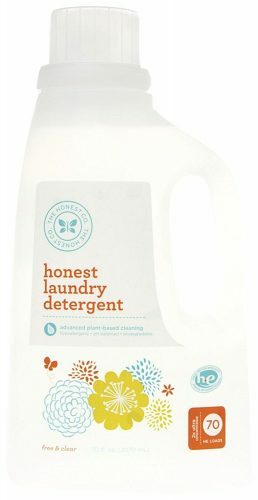 Another color free baby detergent is the Honest Company Hypoallergenic Laundry Soap. The formula is all neutral PH and does not discolor clothing. The great thing is you can use this detergent with all your families clothing saving you money in buying two different laundry soaps. You can use it in all types of washing machines or use it as a hand wash. The liquids made with plant-based ingredients and biodegradable. Further, it is two times Ultra concentrated and available in a 70 fluid oz bottle. 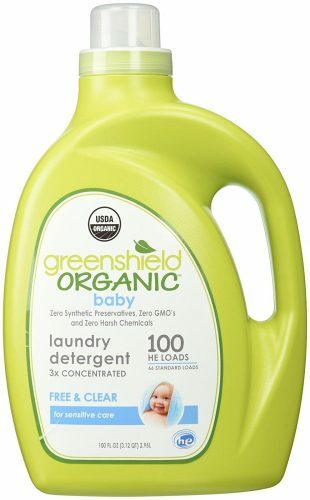 Nothing comes more organic than the GreenShield Baby Detergent. You can buy the soap in a 100 oz size. The formula used is clear of dyes and has no harmful chemicals in it. All the ingredients used come from sustainable resources and even work great on cloth diapers. If you want to keep your baby’s skin free from itchiness then you need to try GreenShield as it is delicate on a newborns skin and is tough on baby stains. You can use the detergent in standard and HE washing machines and is septic system safe. 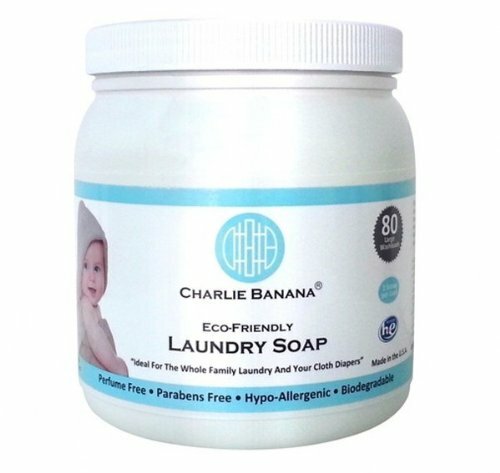 For nontoxic and hypoallergenic baby laundry soap, try the Charlie Banana detergent. This soap is ideal for your baby’s clothes and sensitive skin. The great thing is if you use the Charlie Banana cloth diapers you can use this soap without it harming the material. The detergent dissolves quickly in water and leaves no residue behind. This is an odor free soap made with all natural baking soda and coconut oil based surfactants. Further, it contains no perfumes, brighteners, or dyes that are harmful to your newborn’s skin. You can buy it different pack sizes. The other outstanding thing is the soap is biodegradable and one jar can wash up to 100 loads of clothing. The detergents safe to use in HE washing machines and acts as a softener. 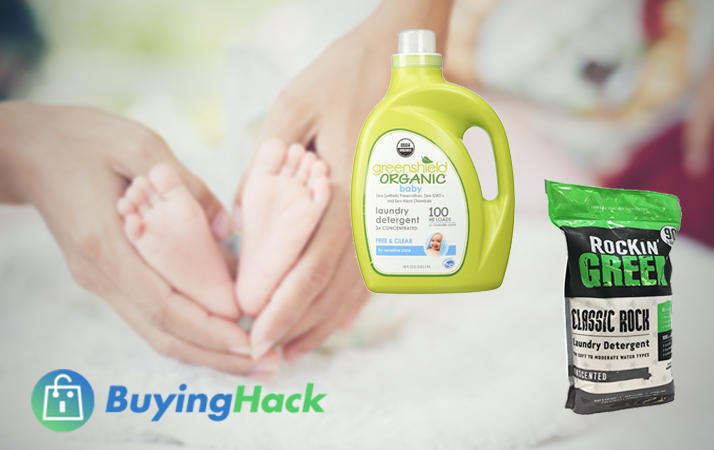 For cruelty-free baby detergents, choose the Babyganics 3x concentrated laundry detergent. You can buy the powder in a 35oz bottle. The liquids dye-free and have a hypoallergenic formula that is delicate enough for your baby’s soft skin. We all know that everyone uses throw away diapers, but if you happen to use the old-fashioned cloth diaper these baby detergents safe to use. All you need is one ounce per load, making it go a long way and available at an affordable price. Be assured that your baby’s skins protected when using the Babyganics detergent. The great thing is the formulas HE safe and you can even use it by washing the clothes with your hands. You can buy it in a scent free or lavender odor. 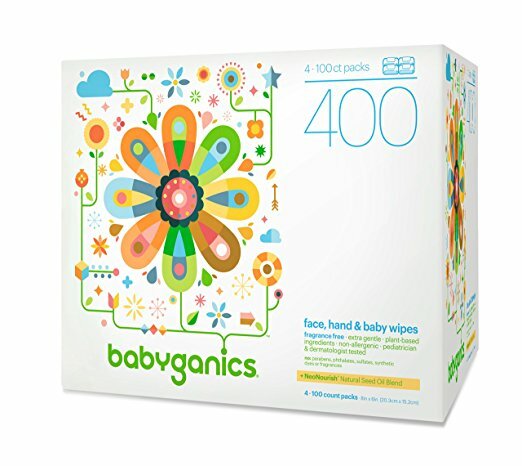 For a fragrance-free baby detergents, you can try the Babyganics laundry detergent. The ingredients used to make the liquid are plant-based with a powerful punch to remove stubborn stains. The formula has a 3x Ultra Concentrated recipe when used. All the ingredients are non-allergenic and both Dermatologist & Pediatrician tested. There are no harmful ingredients used such as chlorine, brighteners, dyes, phosphates, and fragrances used in the formula. Further, the products not tested on animals. 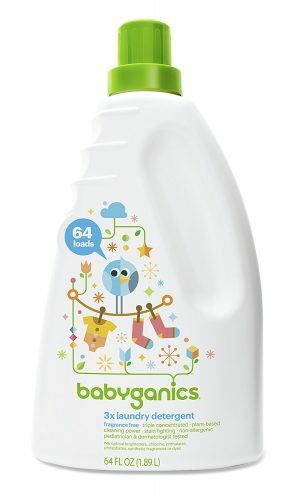 You can buy the organic baby detergent in a 64oz bottle. The product is safe for diapers, baby stains and is HE machine safe.